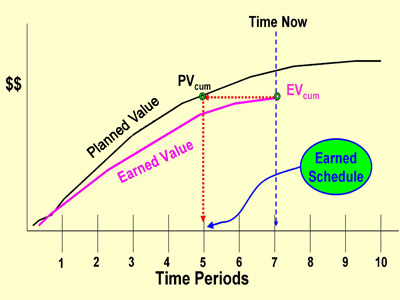 Earned Value Management (EVM) is a wonderful management system, integrating in a very intriguing way, cost …schedule …and technical performance. It is a system, however, that causes difficulty to those just being introduced to its concepts. 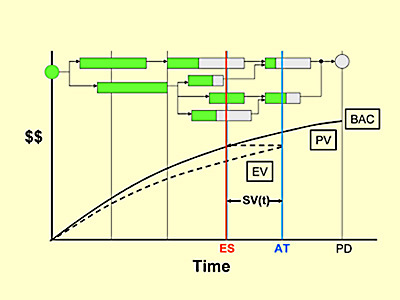 EVM measures schedule performance not in units of time, but rather in cost, i.e. dollars. After overcoming this mental obstacle, we later discover another quirk of EVM: at the completion of a project which is behind schedule, Schedule Variance (SV) is equal to zero, and the Schedule Performance Index (SPI) equals unity. We know the project completed late, yet the indicator values say the project has …perfect schedule performance!! ES resolves the long-standing dilemma of the EVM schedule indicators providing false information for late performing projects. Earned Schedule (ES) is a breakthrough analytical technique that resolves the EVM dilemma. It is derived from and is an extension to EVM. No additional data is needed for acquiring the ES measures; only the data from EVM is needed. In contrast to the cost-based indicators from EVM, the ES schedule performance indicators are time-based, making them easier to comprehend. The ES indicators provide a status and predictive ability for schedule, analogous to the facility for cost using EVM. ES provides the ability to predict project completion dates and is the bridge for performing meaningful schedule analysis from the EVM data. This site aggregates the available information concerning Earned Schedule (published papers, conference presentations and terminology) and provides the availability to download the ES calculator spreadsheet. News concerning ES is posted for keeping everyone as informed as possible. Also, for convenience, we have listed in Contacts those available to provide assistance with your application. Sites of interest are identified which may help in your search for an answer to your question or problem.